read my blog please: Mmm...I love Popsicles!! I wanna eat all of these popsicles!! I looooovvveee popsicles! I love blue ones and green ones and red ones and purple ones! 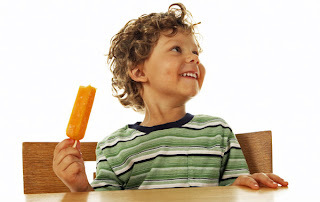 I love it when there are popsicles connected together and then you pull them apart and your one popsicle becomes two! Did you ever drop a popsicle?! I HATE that! When I do that, I'm usually like, "How am I gonna eat that popsicle now?" but then I just get another popsicle and I eat that one! Popsicle is a trademark! If you spell popsicle lowercase your computer will tell you that it's spelled wrong because it should be capitalized always, because it's trademarked and also because they're so wonderful or whatever! Look at this kid! He freaking loves Popsicles! If you give a man a fish, he'll eat fish for a day. If you give a man a Popsicle, he'll be like, "Thanks, dude! I freaking love eating Popsicles!" But tomorrow he'll starve. Anyway, isn't it weird how sticky Popsicles get if you let them melt? I never thought they'd be sticky, but sometimes they get sticky! If you try to make Popsicle plural, like "Popsicles", your computer will say that it's spelled wrong. There is no Popsicles - there was one Popsicle that they cut into long pieces and put on sticks! Don't you get it?! We're all sharing the same Popsicle!! I haven't eaten a Popsicle in like a year! I was just thinking about them the other day! The Popsicle was invented by Doug F. Popsicle in 2003! No one has ever seen a Popsicle without eating a Popsicle right after (usually the very same Popsicle that they originally saw)! If someone gave me the choice between a Popsicle and a plate of sushi I'd take the sushi! But not because I've lied and don't really like Popsicle(s) (why would I do that, dummy?!) 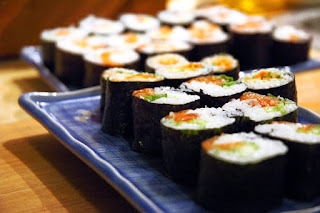 but because sushi is healthier and a better meal and hard to pass up! Right?! If I could talk to a Popsicle, I'd say, "Hey, you're so tasty!" And the Popsicle would be like, "I'm alright." And then I would eat them! And they'd be like, "Nooooooooo!!!" while I ate them! I've mentioned fish twice already! I think I might love fish more than I love the Popsicle! I don't know! New Popsicle Flavors: Pizza, Taco, Vanilla, Miso Soup, Fish, Strawberry! I bet Obama loves Apple flavor Popsicle(s)! Or maybe Orange! They should make every Thursday Popsicle Day and give us all a Popsicle! Why don't they do that?! Wait, who's they?!? I wish I had a Popsicle but I don't yet! Maybe I will later! But anyway! Enjoy your life!